Similar to the way the engine functions as the heart of your car, the transmission operates as the nervous system, delivering commands and power from the engine to the wheels to set its speed. Automatic transmissions depend on a plethora of engine and computer signals to know which gears to engage. Manual transmissions leave that to the special attention of the driver. 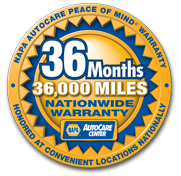 Whether you have an automatic or a manual, our ASE-Certified Technicians have the expertise to take care of you. We will run a full diagnostic check on your transmission—inspecting it for leaks and evaluating the fluid for signs of premature wear or other problems. Of course, we can also completely flush your automatic transmission and drain and replace the fluid in your manual transmission. If your transmission warning light is on, your car won’t go into gear or your clutch is whining, bring your car in for an evaluation. The sooner you address the problem, the better off you and your auto repair budget will be.